I intentionally picked late June for this particular tour with the hope of catching some interaction between the bears, and especially mating behavior. Brown bear breeding season is anywhere from late May through mid-July, with some exceptions even being later. Generally, early summer is the time for brown bears’ breeding season. This image was taken the first night of the trip; we had great light, and were lucky to have this interaction in such great conditions. I wish I’d had a zoom lens on, rather than my 500m f/4 lens, but wildlife photography is definitely an art of making do with what we have handy. Circumstances such as this one are good arguments for using zoom lenses over fixed primes for wildlife photography. It’s hard to beat that flexibility sometimes. 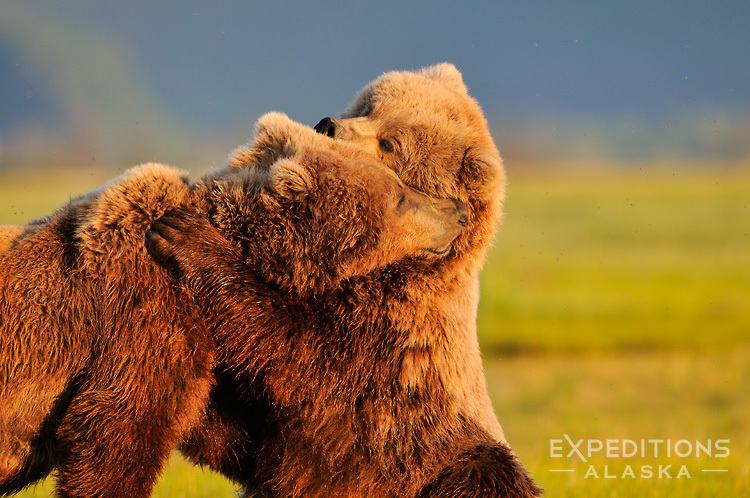 These bears came together several times during our trip, and we were fortunate enough to see and photograph them mating a little later in the week. Definitely a highlight of the trip, for me. This particular night (this image was taken close to 11pm) they played for a while, wrestling and playfighting for a while, before separating and going their separate ways after about an hour or so. The light faded and it was over. Definitely looking forward to heading back to Katmai this year and catching some brown bear photos. They’re always full of surprises, and we never know quite what we’ll see. Thanks so much, I appreciate that, thank you.